Absolutely love these cookies! I have ordered cookies before from BeauCoup and have always been satisfied with their product. BeauCoup sells the best cookies ever. I have ordered several times for different occasions, and every time they were a hit. My whole family is hooked on these cookies. A:We do use nuts in our kitchen but our recipe only uses almond extract which is usually not an issue for allergies. The shelf life for this item is 3 weeks. Please select 1-Day or 2-Day Shipping option to ensure proper condition of this item upon delivery. Please specify a delivery date to ensure freshness of the cookies for your event. Impress your holiday guests with these adorable personalized holiday cookies! 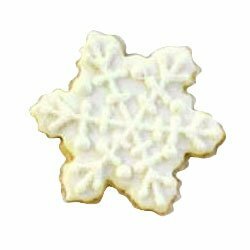 Made from a classic butter cookie recipe with a touch of almond, guests of all ages will love these cute and delectable treats. Our distinguished baker handcrafts each cookie with great care. 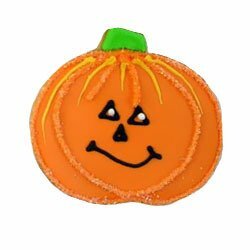 Cookies come in a generous size, approximately 4" x 4", and are hand decorated with royal icing that dries into a sweet crunchy topping. Cookies are chewy on the inside. Shelf life of cookies is 3 weeks. Cookies are packaged in a cello bag and tied with matching curling ribbon. 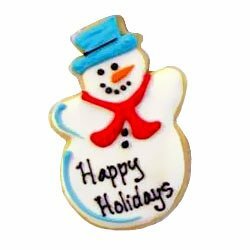 You may also customize your cookies with 1 line of text to mark the special occasion. Note that text is limited to 10 characters so please keep your message short and sweet!